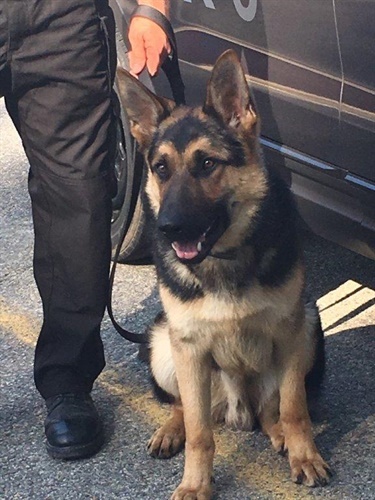 A K-9 named for New England Patriots' tight end Rob "Gronk" Gronkowski has become the latest recruit at the Athol (MA) Police Department. Canine apprentice “Gronk,” a one-year-old German Shepherd, will be sworn in as a full-time officer when he finishes training with his handler at the Boston Police K-9 Academy in July, ABC 6 reports. Gronk will be trained to track missing persons and suspects, locate narcotics, search and clear buildings, and protect officers through deterrence. He will also be sent on community relations missions. Rob Gronkowski tweeted a response after seeing a photo of his namesake, "Hey there Gronk! You so adorable."